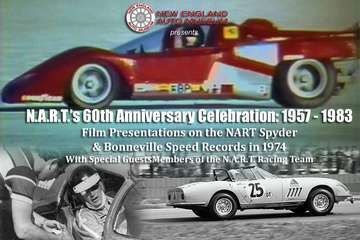 Join the New England Auto Museum as we celebrate the upcoming 60th anniversary of the North American Racing Team (N.A.R.T). This organization was founded by Ferrari pioneer Luigi Chinetti. It encompassed racing legends for over two decades at major track events including a win at Le Mans in 1965, with drivers like the Rodriquez brothers and Sam Posey. In 1967, N.A.R.T introduced the NART Spyder that raced to 2nd in class win at the Sebring 12-hour by Denise McCluggage and is now considered a priceless collectible with only 10 examples ever built. Later in 1974, Luigi Jr. led his team to the Bonneville Salt Flats with two Ferrari’s to break 5 international speed records that had stood for over 35 years! These racers were remarkable and we have the films behind the events to showcase the talent! Not only that, we’ll offer up some members of the N.A.R.T team to join us to showcase personal stories from the races and some Q&A time. An ideal evening for any racing enthusiast! New England Auto Museum will be hosting the two short films and discussion on Wednesday, September 28th from 6:30-9PM. The event will start promptly with an hour long hors d’ oeuvre and wine/beverage pre-show event. Seating is limited so, please reserve your tickets. Of course, weather permitting some classic Ferraris will be on display at the event.